Investissement Québec helps with the acquisition of the new jet. The maiden flight of the first CSeries jet went off successfully for manufacturer Bombardier on September 17. With this milestone behind it, the Montréal-based company expects to secure up to 300 firm orders worth $19 billion by the time the CSeries is commissioned in spring 2014. Investissement Québec will contribute to the success of the CSeries by covering some 10% of the amount of the loan for jets purchased by the airlines. Bombardier relies on the services of 2,000 employees in the Greater Montréal area to assemble the CSeries jets. That number could climb to 3,500, as the order book fills. 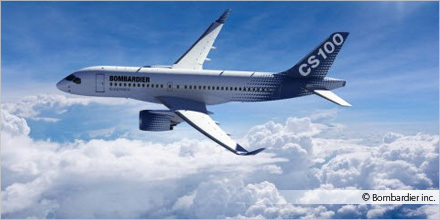 In 2009, the Québec government granted Bombardier $117 million in refundable financial aid for the development of the CSeries.